SDCAP is a newly formed non profit Performing Arts organization, invested in engaging, training, and inspiring students of all ages and backgrounds, who desire to grow artistically and confidently in the performing arts. We would love to have you join us for a class. Friday February 15th, 2019 2p.m. 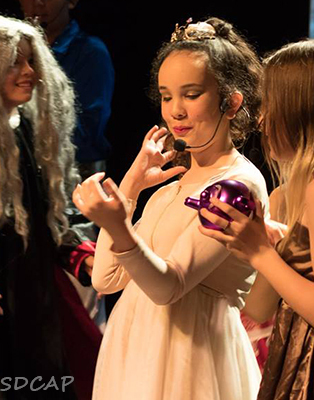 (Special $10 show) 7:00 p.m.
SDCAP is a 501(c)(3) youth theater organization dedicated to teaching and training young actors and dancers to produce high quality performing arts in San Diego County. The company is led by Artistic Director Laura Hodge, a Dance and Theatre Master Educator, choreographer, director, and performing artist, who is dedicated to helping train and inspire students of all ages in the performing arts. Learn to work with directors. Self- Improvement, just for fun, auditioning for American Idol or a recording project. We would love to help you bring out your best voice. Please fill out this information for the Class Teacher. After filling out the form, you will receive an email confirming your intent to join the Class. Be sure to click on the "Confirm Request to Join" link in this email. This will allow the Class Teacher to add you to the Class.